Founded in in 1868 by the Reverend Jesse Knight, one of the first settlers in this region of Florida, Venice-Nokomis United Methodist Church has been providing spiritual guidance to the community for 147 years. Like many houses of worship, the church has evolved over time in order to address the interests and expectations of its congregation. 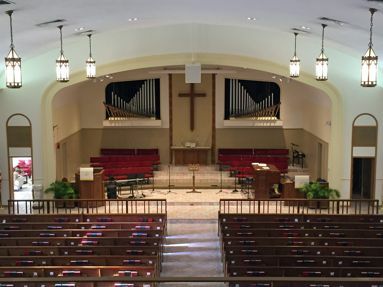 Recently, church management determined that a new sound reinforcement system was necessary to better support its various programs—and this led to the deployment of an X3i Ultra Compact Line Array system drawn from the TrueLine catalog of WorxAudio® Technologies (www.worxaudio.com), a division of PreSonus® Audio Electronics (www.presonus.com). For additional information about Creative Sound and Lighting Solutions, LLC, go to www.creativesoundsolution.com.